“I am a sick man….I am a spiteful man. I am an unattractive man” ; and thereupon does Dostoyevsky begin his Notes from the Underground, a fictional account of an anonymous cynical-pessimistic man, who internalizes his vengeful actions whereupon unbridled spiteful emotions, and frantic outburst, rule and control the poignant anti-hero. Writing down recollections from various incidents in his life–for no one other than himself–that have plagued him hitherto, Underground Man opines: “But what can a decent man speak of with most pleasure? Answer: Of himself. Well, so I will talk about myself.” And so ensues the introspective madness. Underground Man reflects on the absurdity of society at large; viz., the overwhelming consensus that reason is the sole dictating and guiding force for all virtue, truth, and moral uprightness. What could be more absurd, his mind runs, than assuming that intellect can actually dictate virtue–for he is a man of chief intellect, yet notwithstanding such an intellectual caliber, is riddled and plagued with spite, envy, cynicism, and revenge. Underground Man attacks those who rely so heavily on reason, scientific naturalism, and those who see vice as merely an error of intellectual judgment, concluding that according to such a worldview consistent with their systematic ‘laws of nature,’ an argument ad absurdum only follows logically: “Thus, it would follow, as the result of acute consciousness, that one is not to blame in being a scoundrel.” He contends that what his mind procures, his actions do not follow; and what’s more, his heart is not utterly detached from his mind, but his mind even procures such evil and vile deeds–ones such as his vile heart could not even begin to think up–which he swiftly and decisively acts upon, knowing full well that his actions run contrary to reason sometimes only insofar as humans don’t want rational algorithms, but want freedom. But why is this not clear to the Age, he muses; why cannot they see that the world is much more than set naturalistic laws explaining all of reality? Can one dare question the Age of Modernism without ridicule? “The impossible means the ‘stone wall!’ What stone wall? Why, of course, the laws of nature, the deductions of natural science, mathematics. As soon as they prove to you, for instance, that you are descended from a monkey, then it is no use scowling, accept it for a fact. Upon my word, they will shout at you, it is no use protesting: it is a case of twice two makes four! Nature does not ask your permission, she has nothing to do with your wishes, and whether you like her laws or dislike them, you are bound to accept her as she is, and consequently all her conclusions! And so Underground Man forthwith goes into his account of his spiteful hatred towards one police officer; he recounts his meeting with his childhood acquaintances, and the absurd and mad dinner that thereupon followed; his angry diatribe and hatred spewed towards the four after dinner; his journey to the brothel; his awkward encounter with Liza the young prostitute; her unwarranted attraction to his poignant cynicism towards humanity and its woes; and lastly, the terrible encounter with Liza when she arrives at Underground Man’s rancid and pitiful house in Petersburg. Of these accounts, much can be said, but as it stands, I’ll limit my reflections simply to the first portion of Notes which is all of Underground Man’s philosophical speculation. It seems best to conclude that Dostoyevsky presents an attractive and enthralling case, à la his surrogate anti-hero the Underground Man, against the rationalism, positivism, determinism, egoism, and ridiculous Utopianism that was so pervasive throughout late-modernity in Russia. 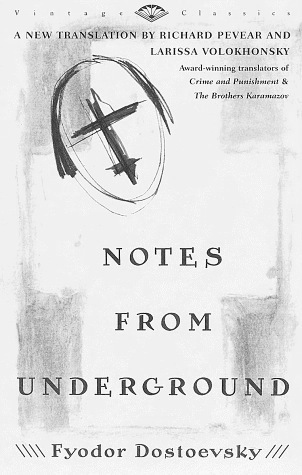 In short, Notes from the Underground is the most brilliant piece of existential literature hitherto. I’ve never been more excited about this journey into such a new and attractive realm of philosophy–I’ve never related, reflected, and personalized so much of Dostoyevsky’s thoughts as I have in Notes. “Gentleman, I am joking, and I know myself that my jokes are not brilliant, but you know one can’t take everything as a joke. I am, perhaps, jesting against the grain. Post-modernism continues to push humanity into neat systematic soft-sciences; sociology, psychology, and anthropology–as it stands, we have created a man centered existence wherein we seek and forthwith obtain for ourselves maximal glory. What a sad state of affairs we find ourselves in–one wherein hot yoga, positive thinking, and naturalism are the norm; forsooth!–O LORD, please deliver us! Yea, to be sure, I want none of the aforementioned: I want to suffer. Wherefore? To know that I am alive.